When a national real estate guru comes to Denver to address Realtors, it’s usually like a high school pep rally. Realtors are told that the glass is half full. The market is about to turn. And all they need to do is list more properties for sale to succeed. Steve Harney came to the Daniels Cable Center at the University of Denver to address and all Kentwood Realtors. His message was different: The Market is lousy and it’s going to get worse. Denver MLS statistics show that we currently have a 5.4 month supply of homes on the market. 3 months is considered optimal and “in balance”. So, we do have what is classically defined as a “Buyer’s Market”. 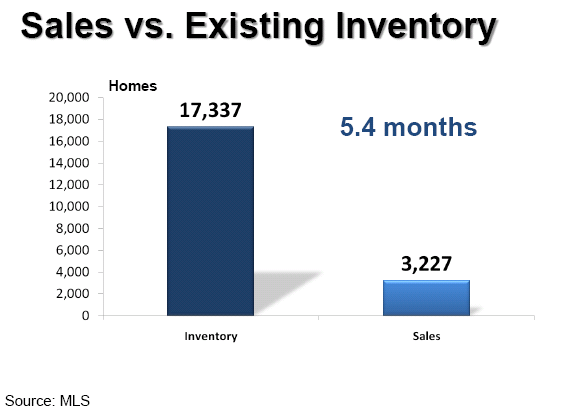 Other areas of the country have up 16 months of inventory on the market. “Oh sure, you are doing better than the rest of the country”, Harney proclaimed. “But, there is a tsunami coming and you are not going to be able to avoid it…Get your Sellers to price for sale now, not later…Prices have to go lower”. Homes in default for 90 days or more on mortgages. Why? 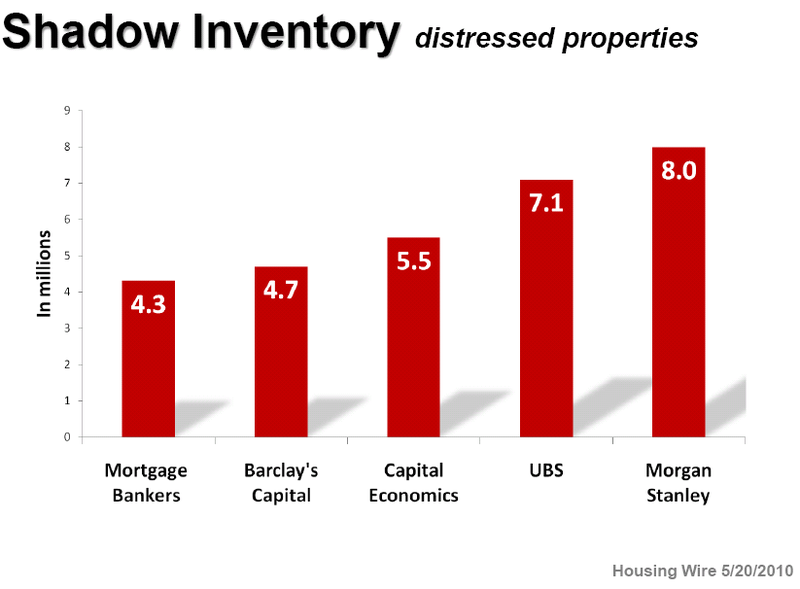 It’s the “Shadow Inventory” variously estimated to be 4-9 million financially distressed homes that will come onto the market soon. Those are homes more than 90 days in default. Less than 5% of those will be cured before foreclosure or short sale according to Harney. But every cloud has a silver lining. In this case, Harvey says Buyers should not wait for lower prices but buy now. Why? Because at these historically low interest rates, the total payments for a home will likely never be lower. 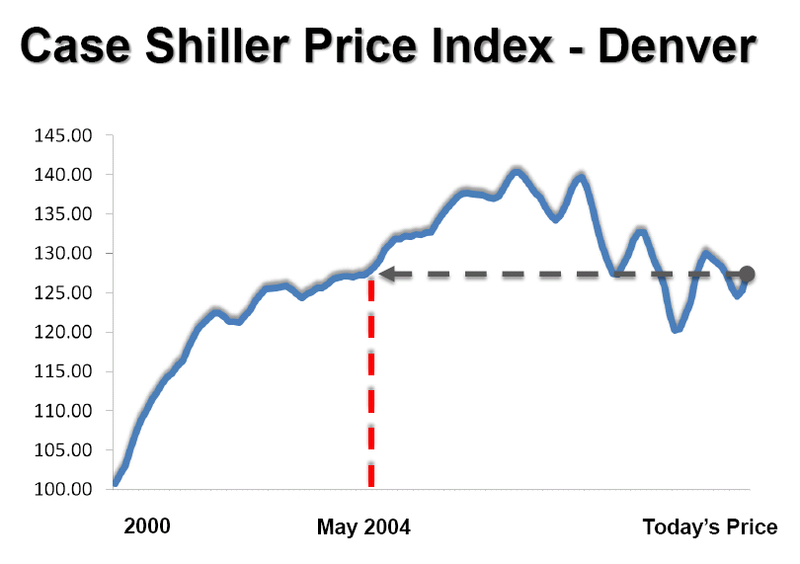 So far, Denver real estate prices have only declined to 2004 levels. 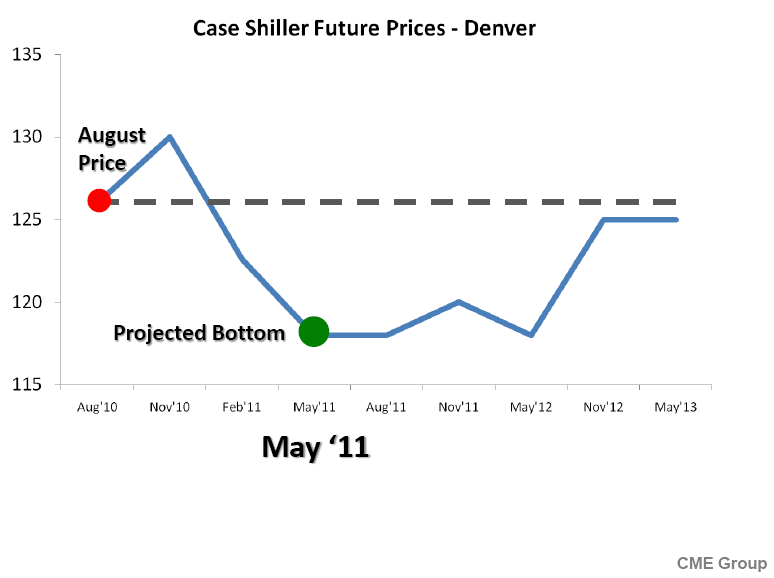 He explained that a typical $500,000 home is now priced at the same level it was priced in 2004 in Denver according to Case-Schiller statistics. The difference is that the interest rate now is now down to the 4% range. So a $400,000 fixed mortgage payment is only $1906 per month including principle and interest. That same payment in 2004 for a $400,000 home loan was a whopping $2468 at an average of 6.27% interest. Even as prices continue to wane, payments will likely never be lower. Once rates start to rise, as they inevitably will, Harney says look-out. They will rise quickly and the low payments a Buyer can get today will go away quickly. The best time for a buyer to buy is when lower prices and lower rates combine to make low payments. That makes this time a great time to buy. There may well never be a better time. This is a great post. I love it when someone well respected takes the time to be brutally honest instead of blowing smoke, hoping that the audience will invite him back because they feel so uplifted, hence earning him another paycheck. HE has given us (me through this post) useful information to pass onto both buyers and sellers. For example, if I say this to a seller they’re motivated now to sell….but without explanation of the forthcoming assumption that interest rates are going to rise, a buyer might wait. No! With rates climbing any drops in price will not make up for the rise in monthly payment that you’ll “feel”. Good post! Thats great post. I love it when someone well respected takes the time to be brutally honest instead of blowing smoke, hoping that the audience will invite him back because they feel so uplifted, hence earning him another paycheck. HE has given us (me through this post) useful information to pass onto both buyers and sellers. Don’t you just love it when some self appointed real estate guru predicts the future. It is so warm and fuzzy – reminds me of the days – not so long ago – when self appointed real estate gurus were telling us the market will just go up and up. Get honest, you don’t know. I don’t know and even Shiller doesn’t know. So why not actually be honest and just say so. It’s such a ploy to tell people to reduce their prices so much when you just plain do not know. And if it turns out to be accurate it is nothing but luck. Of course, no really does know for sure unless they visited us from a future time. One purpose of this blog is to offer facts and opinions about the future of the real estate market. We try to include a variety of both. Then, the reader can come to her own conclusion. Opinions about the future of the Denver real estate market are like belly buttons. Everyone has one. Especially at a cocktail party!